Mary-Kate Spring of the Celtic folk band Seasons plucks the strings of her floor standing wooden harp in the Penn State Cancer Institute lobby. Music is a universal language. It can inspire, nurture and calm the soul beyond words. 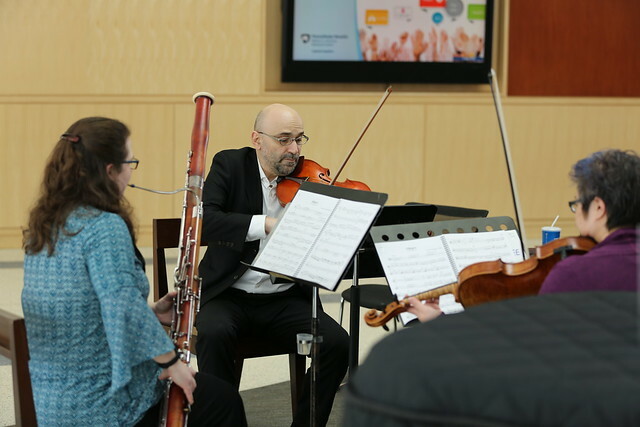 And at Penn State Health Milton S. Hershey Medical Center, music is a soothing balm for patients, family and staff who flow throughout the facility daily, thanks to the Center Stage Arts in Health program. Lobbies, waiting rooms and common areas become comforting oases from the waves of stress, anxiety and drama found in any hospital environment. The founders of Penn State College of Medicine blazed the trail for Center Stage by launching a humanities department in 1967. Like the College of Medicine’s Department of Family and Community Medicine—also celebrating its 50th anniversary—the Humanities Department was the first of its kind at any medical college in the U.S. As with anything new and different, people at the time questioned why a college of medicine needed a department associated with liberal arts education. The importance of humanistic treatment is the guiding principle of the Milton S. Hershey Medical Center. And instilling this philosophy in the future doctors, nurses, faculty members and staff at the College of Medicine would result in a new breed of professionals providing care for the whole person – body, mind and soul – and elevate the college and its graduates in everyone’s eyes. The new department created a greenhouse for a variety of art and music therapies at the hospital like no other in the nation. Some 50 years later, Center Stage arrived on the scene. “The program was a collaboration of hospital leadership, creative minds and the artist community.” said Claire de Boer, founder of Center Stage and current director of the Doctors Kienle Center for Humanistic Medicine, where Center Stage now resides. Today, Center Stage offers patients their choice of artworks to brighten their rooms, opportunities to create their own masterpieces while recuperating, creative writing classes with noted authors and more, in addition to its centerpiece of live music. By putting creative minds together and building a bond with the artistic community, Center Stage rapidly evolved into a model program for other health care facilities nationwide. The seed money grows every year thanks to the success of the program, support of the hospital and philanthropic organizations that recognize its value to artists, patients and the region. In fact, Center Stage received a National Endowment for the Arts award of $10,000 in November 2017 to build partnerships with the Harrisburg Symphony Orchestra and Central Pennsylvania Friends of Jazz. The grant funds a combined 15 performances from the two premier music organizations in the region. The goal is to offer world-class music to match the medical care provided at Hershey Medical Center. With more people downloading and streaming music on devices and fewer attending live venues, the grant helps musicians connect with their communities and find audiences. One thousand listeners coming and going can experience a concert in the hospital’s main lobby alone. Musicians value the chance to make a profound difference in people’s lives beyond entertainment. Center Stage always offers a paid engagement, important to working musicians who want to make an impact while still making ends meet in an unpredictable calling. This foundation of mutual benefit fosters a relationship of trust between the hospital and the local arts community. Center Stage does not actively solicit musicians but chooses from a highly motivated pool of accomplished regional performers who learn of the program from their peers. The sensitivity to patient and family needs and ability to connect with them in a caring and meaningful way is a much rarer commodity than their musical merit. The hospital environment can be challenging compared to a club full of revellers demanding little but upbeat tunes and good times, and musicians learn to adapt and enjoy the interaction. De Boer emphasizes the work that happens at Hershey Medical Center must come first. That was evident in a recent performance by guitarist Jay Umble. Playing soothing songs to a family awaiting news of a loved one undergoing an operation, Jay quietly packed up his guitar when the surgeon entered the waiting room. Jay’s gentle presence had played his role, a prelude this time to welcomed good news. Center Stage is not only for patients and families. Health care professionals in an environment that sees trauma, pain and life-or-death decisions daily find stress relief and a reliable refuge in the soothing music. And that translates into better care for patients and benefits for hospitals. Studies over decades have borne out the numerous benefits of arts in health care. Just a few are improved pain tolerance, better outlooks and increased sociability for patients. For their caregivers, the benefits include reduced stress, a more welcoming workplace and greater staff retention. Every Friday from June through September is special at Hershey Medical Center. The in-hospital performances are the staple of Center Stage but not the only offering. The seasonal courtyard performances of Lunch with Center Stage are a popular respite for staff, students and patients. The academic year-round First Friday program of the Department of Humanities features lectures and presentations by people from a variety of disciplines who share their perspectives on the arts in medicine with the hospital’s health care professionals. Recent performances included a cartoon artist illustrating the history of medicine and a theatre group dramatizing end-of life-care. It’s just another way the arts and humanities inspire and touch everyone involved with Hershey Medical Center. No one has felt that power more than Center Stage’s founder and director. For more information on the program, visit Center Stage Arts in Health. To attend free Center Stage musical performances, consult the monthly Center Stage calendar. Entry filed under: Features. Tags: Center Stage, Humanities, music.